The PLR sends it downstream with the RRO. The MP sends it upstream with the RESV message. The PLR sends it downstream with the ERO. 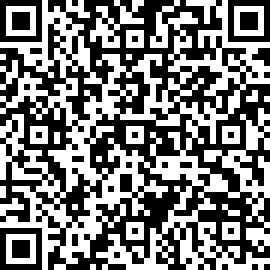 It associates all detours with the source PLR. A router will never receive a packet containing this label value. Signal a new label to the peer that sent the packet. PUSH an additional label onto the label stack. Request a new label from the peer that provided this label. an FEC for which it has a label mapping for the FEC next-hop. Which of the following statements regarding per-platform label space are true? Choose two answers. to be used for traffic sent over that interface. A single label may be assigned to an FEC and used across all interfaces of the same router. A separate label is used for each interface that the FEC is advertised on. It uses fewer label resources than a per-interface label space. Which of the following can be used for label signaling and distribution on the Alcatel-Lucent 7750 SR? Which of the following are top level TLV types defined for OSPF-TE? Choose two answers. Export policy applied to advertise multiple labels for a given FEC. Hashing used to select the egress label. T-LDP enabled with peers to which load balancing is desired. ECMP enabled in the config>router context. The LSP is in the administrative down state. The router's router ID overlaps another. The router's interfaces do not have LDP running. 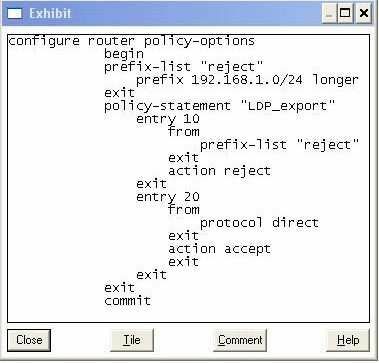 The policy on router R2 is applied as an LDP export policy. What FECs now appear in router R2's LIB? Local FECs, not including those in the 192.168.1.0/24 address space. Only system ID FECs may appear in the LIB. Any local FECs, except those with a 24 bit mask. How does MPLS-TE overcome the issue of IP hyper-aggregation? By enabling the creation of LSPs across alternate links to balance the network traffic. By eliminating the requirement for core IP routing. By not allowing more than one LSP to use a particular path. Consider the output shown; why is the label in bold font not in use? The router cannot do a SWAP of this label. The label was signaled in error. The label does not match the egress label for the same FEC. establish an LSP after it has failed? Click on the exhibit button below.Consider the output shown; what table is displayed? Consider the output shown; what table is displayed? The protected path is R1-R2-R3-R6. Fast reroute one-to-one protection is enabled. Under which condition might the peer LDP ID 10.10.10.2:0 entry show state "Nonexistent"? When the interface to the peer router is down. When the targeted session is not yet configured. When router R1 has no route to the peer address 10.10.10.2. When the adjacency between the two routers fails. Each router's OSPF interfaces are in the areas shown. Bidirectional LDP-over-RSVP tunnels extend from routers R1 to R3 and back over the path R1-R4-R5-R3. You enable fast reroute facility bypass on the R5-R3 RSVP LSP. Router R5 acts as a PLR, protecting the R5-R3 link by building a bypass tunnel through router R2. configuration step must you complete on router R2 for it to protect the end-to-end service? Enable LDP on the R2-R5 interface. Enable LDP on the R2-R5 and R2-R3 interfaces. Enable MPLS and RSVP on the router R2 network interfaces. 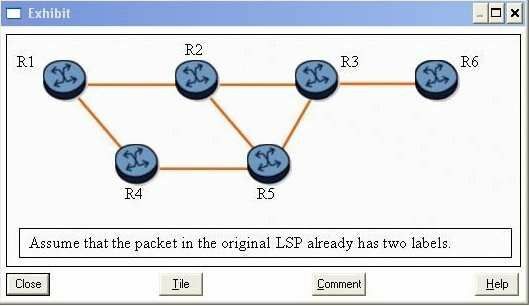 Configure T-LDP sessions between routers R2 and R5 and R3. 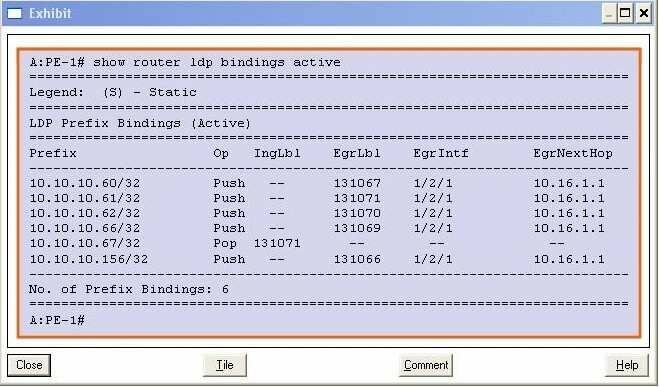 Configure LDP-over-RSVP support on router R2. path, if the head end can find one?